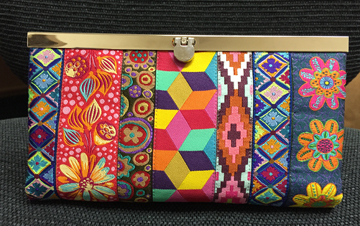 The Quiltzette: Make a Diva Wallet with Ribbon! The Diva Wallet has been a favorite around here for at least a year. Now it’s even better . . . covered in beautiful ribbon on the outside! Judy Bryan will teach this afternoon class. Caution: Once you make one of these you’ll want to make more. 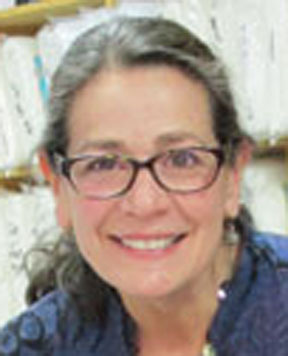 One of our favorite long arm quilters, Beth Cardozo, is moving back to New England. We will miss her very much. The good news is that she'll be back to visit from time to time as her daughter lives in the area. Here's a note Beth sent out yesterday to her clients and friends. If you are receiving this e-mail it’s because I have had the privilege of quilting one or more of your quilt tops for you. I have thoroughly enjoyed my time here in the South West corner of Colorado and have made so many great friends here. This note is to inform you that I am moving to Camden, Maine. My phone number and website: www.willowscharm.com will remain the same. My new address is: 3 Pleasant Ridge Drive, Camden, Maine 04843 and can also be found on the order form on my website. I quilt for clients from all over the country, so please don’t hesitate to contact me for any of your quilting needs, or just to say hello. I am also on Facebook and Pinterest. Guest teacher Caroline Spurgeon will teach a full-day class in twining on Wednesday, August 17. Twining is an ancient technique that is quick and easy to do. Twining is suitable for a variety of projects and adaptable to many materials. Twined bags have many uses depending on the size and material used. They may be simple and durable bags for shopping, knitting or book bags, or elaborate bags made with fine yarns and intricate in design. Students will be working on their own adjustable loom. We will begin with the warping process and continue with the basic techniques and complete with finishing ideas. Students will leave class with a finished bag and ideas for twining more of these useful bags. Ages 14 up. Students need to bring scissors, heavy or bulky yarn to twine with – you may bring your own or buy yarn. Looms will be available to borrow or buy. 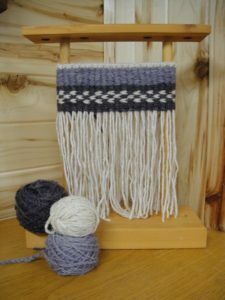 Instructor will furnish warp yarn and items to accessorize your bag. NOTE: To participate in this class you must sign up and order your yarn no later than Saturday, August 27. Many beautiful colors to choose from on the swatch card at the shop. 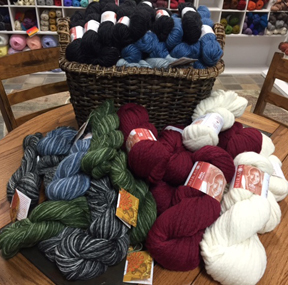 Mirasol alpaca and llama blends make soft and luscious scarves, shawls, hats and cowls. 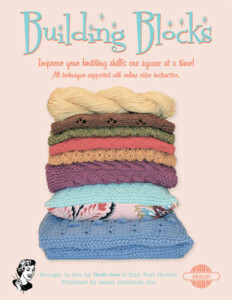 Use your imagination and combine different color yarns for a project. By purchasing Mirasol you are supporting the children of Peruvian shepherds. A portion of each purchase goes to fund a boarding school in the Puno region of Peru. We published this tip in early 2015. Since we have so many new subscribers to the Quiltzette, we're offering it again. So, you've finished your beautiful quilt top, table runner, or wall hanging and now you have to decide how to quilt it. Good news . . . you have many options! Small projects such as table runners and place mats can easily be quilted on your home sewing machine, and many of our customers quilt very large (think queen size) projects on their machines. 3. Simple quilting designs. For this method use a marking tool to indicate where you plan to stitch. Engage the guide that attaches to your presser foot and you can draw only one line across/down the middle of your project and then stitch, for example, 2 inches on either side of that line, working your way out to each edge. Stitch in the other direction to create a crosshatch design. 6. Hand quilting. Yes, some of us still do this. We recommend Gutterman hand quilting thread and the 17" square Q-Snap frame that fits nicely in your lap. We have both at the shop. 7. Quilt by check. 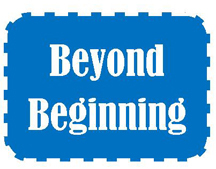 We are fortunate to have access to many experienced and talented long arm quilters. If you're not up for doing your own quilting, simply write a check and turn the task over to an expert.